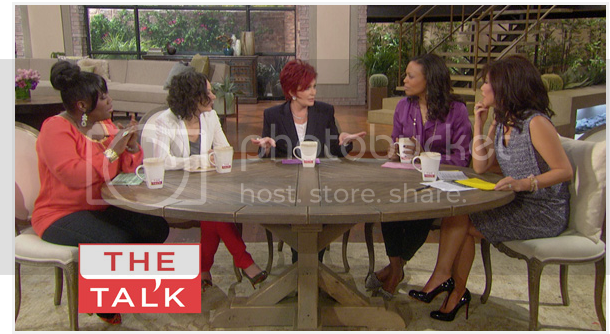 Um...who is casting The Talk? Let's talk about The Talk. I realize how ridiculous that sentence sounds, but I stand by it. So I just found out this show existed. It's basically The View only sadder. In watching a clip from the show within an article I was reading, I was overwhelmed by the mediocrity of the cast on this show. Daytime T.V. producers: this is seriously supposed to compete with Ellen? Ellen could wipe the floor with these yahoos. When Sharon Osbourne comes off as the insightful, wise one, you know you've just slapped this thing together all willy-nilly. Really, The Talk? Really? You were created by Rosanne's Daughter. No one knows her real name [Sara Gilbert, BTW], which is why I had to click on it in Wikipedia to even realize who she was. Have we not collectively decided as a society that not only has her prime passed, but also that she is the worst? I don't even know why I think she's the worst. She just looks like she would be. And not only is Rosanne's Daughter responsible for this monstrosity, she is also one of the cast members. Really? Who heard that pitch and was like, "YES. THIS WILL BE THE BEST SHOW EVER AND TOTALLY TRUMP THE VIEW?" Get real. And really, Aisha Tyler? I thought you were better than this. You had a recurring role on arguably TV's most beloved sitcom. YOU WERE CHARLIE. And you will always be Charlie in my heart. Which means in my heart, you are an accomplished, sophisticated paleontologist and NOT 1/5 of a televised round-table discussion about Simon Cowell's "goods" or lack thereof (yuck). Don't resign yourself to this kind of mediocrity. 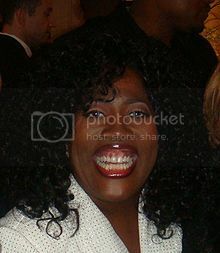 I don't know who she even is, but she is BEARING HER TEETH AT US! DON'T LOOK DIRECTLY AT HER! JUST PLAY DEAD. I think she's supposed to be The Funny One, but judging from the clip I saw, I think she's really just The "You Go Girl" One. Then there's Julie Chen, who is supposed to be the "moderator." I think this means she's supposed to act serious and ask questions and have big hair. I don't know. She seems like a definite waste of space. And really? The original cast included Leah Remini and The Girl From Hairspray (play version)? This is the most ragtag group of non-specials I've ever seen on television. How bad do you have to be to be fired from The Talk, especially considering who got to stay [see: teeth-bearing intimidation technique above]? I mean, really. Who wants to listen to these people talk for an hour? NO ONE, that's who. Four people, tops. I might've been able to tolerate Aisha Tyler, but we've already established that I'm disappointed in her. GO HOME, guys. Just throw in the towel. Really. Who do you think would make more interesting panelists on a show like this? My votes: LC from The Hills, Stefan from SNL, Beyonce, Neil Patrick Harris, Tina Fey. Newer PostBooks I'm Gushing Over: "Every Bush Is Burning"